I’m writing this on Sunday evening as the wind is gusting and rain is starting outside my window. 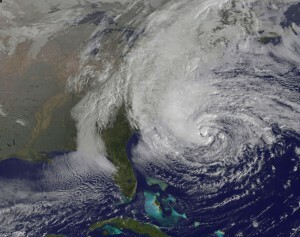 I guess Sandy is really going to make an appearance here in the DC Metro area! A lot of damage can be avoided if we take a few minutes to prepare. But what should we do? Of course there are the batteries, flashlights and food you should have on hand, but what steps can we take to help protect our homes? 1.) Install a Barrier. Water can infiltrate a home from the tiniest of cracks. Places that you can’t even see! Create a barrier by laying down a plastic tarp at the seam of your home. Quickly head to your local hardware store and get one of those large heavy plastic tarps. If they don’t have any, get the largest trash bags that you can find, that will work just fine too if you use a lot of them. Place it at along the base of your home where the house meets the dirt. Use rocks or sandbags place near your home to create a little hill at the base of your home and also to keep the tarp in place. 2.) Cover window wells. Make sure all your window wells are covered. Open window wells are notorious for allowing water seepage into your home. If you can’t find actual window well covers or if the store doesn’t have your size, no problem, just use the same tarp and rock trick I mention above. 3.) Sandbags. Place sandbags around the perimeter of your home, especially at the door seems. This will create a barrier so that the water has to go over the sandbags to get into your home. Without sandbags in place, the water can come through the tiny seam around and under your doors where the weather striping is. 4.) Clean out gutters and drains. Make sure all your gutters and drains are clear of leaves and debris, especially now that it’s Fall and the leaves have fallen. Make sure to extend your gutters away from your home with gutter extenders—they cost about $2 and take about 5 minutes to install and will save you huge headaches in the future. Make sure the floor drains at your front, back and basement doors are clear and able to drain properly. 5.) Secure all outdoor furniture and grills. Bring in all your outdoor patio furniture and grills so they don’t become airborne. If you can’t bring them inside, use rope and secure them to your deck, tree or some other object that will not move in the high winds. 6.) Trim Trees. If you can, trim any tree branches that are not stable enough to withstand the wind. If you can’t get to them and they are near power lines, call the electric company, they would prefer to come out now as a preventative measure than after there is an outage. I hope that you and your home make it through the storm untouched. The tips above are great to keep in mind year-round for any rainstorm even if you’ve never had a problem so that one never occurs. As always, I want to hear from you, so let me know how you faired in the storm. If you do unfortunately get any storm damage and need any suggestions for waterproofers or the like, just let me know!